Somewhere between Beyoncé’s Lemonade and Janelle Monae’s Dirty Computer lies Donald Glover’s latest project, Guava Island. Starring Glover, Rihanna, and Letitia Wright, the 55-minute Amazon production tells an island fairy tale. Written by Stephen Glover, shot in Cuba, and featuring an exclusively black cast, the story feels like an amalgamation of West African, Gullah, and Afro-Latinx folk hero stories wrapped in a very Childish Gambino paper. This isn’t always a bad thing—its tight runtime and straightforward message, mixed with infectious music, makes the film an enjoyable weekend-morning stream. Director Hiro Murai has created a highly-stylized visual narrative similar to Yoncé’s Lemonade, and using Cuba as a stand-in for the fictional Guava Island is a smart move. Nothing about the locations seem commercialized: The faded pastels on the houses, the sea-salt air, and the sun can all be felt without having to add a layer of Hollywood glamour. Murai’s camera paces back and forth between a more realistic, documentary style and highly stylized tracking shots, which gives the film a dreamlike quality suited to a folk hero with his head in the clouds. Like Monae’s Dirty Computer, Guava Island is a love story; it begins with Kofi Novia (Rihanna) telling the tale of how Deni Maroon (Donald Glover) wooed her. She tells her audience that, “The seven gods created the dueling truths: love and war. The gods then decided that humans would need a place from these elements.” Guava Island is home to a clayworm that made silk so beautiful everyone wanted to have it; the people fell in love with the silk and war quickly followed. The Reds, who have no discernible differences from the rest of the islanders, took over the island, and the people began to work long hours. Rihanna gives a solid performance, though she isn’t given much to do. Her best moment comes early in the film, as Kofi informs the audience that Deni tried to win her love by writing a song as beautiful as she is. “Fortunately, no song is that beautiful,” she fires back. From there, Rihanna must look forlorn as her love puts his life in danger. Glover’s onscreen work here is similar to that in the “This Is America” video, and he slips in and out of an affected island dialect. Eventually, it disappears altogether, which is probably for the best. If the gods’ goal was to shield the island from war and love, they failed when the Reds took over. All work and no play has lovers running to one another and war in the streets. War and love intertwine Kofi and Deni’s relationship as well. Kofi, eternally unfazed and unable to express the affection she feels for Deni in her heart, remains at odds with her lover. She questions not his talent or ability, but the world’s willingness to change. Her conflicts are internal, while Deni’s are external: He’s frustrated by everyone’s refusal to recognize the glory that surrounds them. The Glovers’ and Murai’s work on Atlanta is known for subverting stereotypes and engaging the black community at their pace. In other words, there’s very little being explained in Guava Island. For example, while Deni is walking to work, three young boys try to rob him. When he looks for help, an older woman simply shakes her head and closes her window. The boys are armed with a small mallet, an old electric drill with the frayed cord wrapped around it, and what looks to be a very large tree nut. The masks they wear are terrifying, but hide the faces of children. Red Cargo has hired them to be “soldiers,” but Deni knows them by name. He’d even previously agreed to help one with his music. Once again, love and war exist at the opposite end of the playing field, tormenting the boys. Guava Island works best as a platform for Anozie, whom Game Of Thrones viewers will remember for his support and then betrayal of Daenerys Targaryen in the role of Xaro Xhoan Daxos. The film relies mostly on Anozie’s height, deep voice, and access to money to mark him as the villain. He is Deni’s exact opposite, the war to his love. He mentions, offhandedly, that he wanted to play guitar, but his father would not allow it, before smashing Deni’s guitar to bits. He demands that Deni cancel a concert he’s planning, believing those who attend will be too exhausted to report to their posts the following morning. African and slave folk lore is vast, but their stories aren’t typically framed with villains and heroes. Bad guys are simply people with different world views. Virtue as described in western culture need not apply. So too, Red Cargo believes he’s doing the right thing by forcing everyone to work nonstop. The clothes made from the worm’s silk do seem to be the island’s only export. But the people are tired. And the red-shorted folk hero refuses to back down, going through with the concert and striving to remind the island of its magic through song. But that brings about more trouble, and a climax that may cause a fleeting sense of Us déjà vu: A masked figure hunts a frightened soul; an abandoned classroom with desks strewn about. On the heels of the death of Nipsey Hussle, Guava Island has a lot to say about how the black international community engages in joy and celebration. Music acts as a gateway to bliss and a release of tension. Think about how often black music, particularly rap and gospel, has for decades been wrapped in the unjust and untimely death of black bodies. It sours the taste of sweet beats. 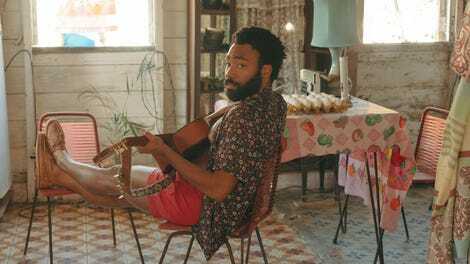 Guava Island debuted alongside Coachella livestreams of some of today’s most prominent black performers—Glover included—performing for audiences that were visibly white. The film presents a beautiful world of escape: Two of the world’s biggest pop stars, surrounded by melanin and searching for peace. Short, sweet, and to the point Guava Island proves a catchy little musical number. Bookended by Rihanna’s hypnotizing voice over, a magical fairy tale weaves the oldest story: Dream big and be prepared to sacrifice and anything is possible.